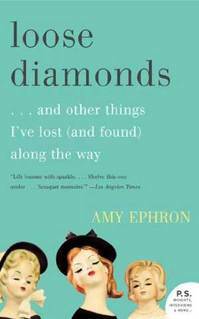 loose diamonds by Amy Ephron. Publisher: William Morrow Paperback (September 2012). Memoir. Paperback. 166 pages. ISBN: 978-0-06-195878-6. Certainly the Ephron family grew up unlike many other families but also like many families in Hollywood. Creative. Eccentric. Domestic help. Private schools. When Amy Ephron had her own family she also had help raising her children and sent them off to various private schools. Amy wrote two charming historical novels that I recommend as often as possible, A Cup of Tea and One Sunday Morning. In this delightful collection of essays, Amy Ephron shares her deft observations about a multitude of subjects including her childhood, her mother, giving birth, fancy shoes, shopping (particularly at Saks), affairs, flying, her first marriage, divorce and her second marriage. She loses things—sometimes objects, sometimes relationships, sometimes emotional states– and through heartfelt, witty, insightful and clever means, she explains to the reader how she’s learned from those losses. It’s a sparkling memoir. Can you imagine separating from your husband and he proceeds to sleep with most of the mothers in your son’s elementary school class? This happened to Ephron and she tells-all in “Musical Chairs.” She’s tipped off when a strangely jealous mom rear-ends her at pick-up time. Two years after her divorce she remarried and writes honestly in “Post-Modern Life” how “families meld, change, grow, have spats, meltdowns, blowups, periods of time when they don’t speak and periods when they’re incredibly cozy, envy morphs into support or vice versa (particularly if the siblings are close in age).” My favorite might be the apropos newest essay added to the paperback edition “The Best Kept Secrets” in which Ephron ponders secrets and whether affairs must become public knowledge or not. Can a kiss be just a kiss?